Intelligent, loyal, and gentle, the Cane Corso is a shining star of the Mastiff family of dog breeds. Once almost completely extinct, the Cane Corso has humble roots in Italian history as a working dog, but all but disappeared in the middle of the 20th century, according to the AKC. 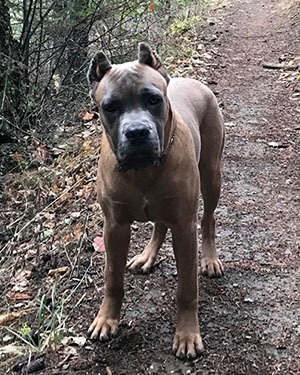 A group of enthusiasts began working to bring the breed back from the brink of extinction in the 1970s, and from there, the popularity of this Italian Mastiff has blossomed. The Cane Corso is actually the most Googled dog breed in all of Europe, and the breed that is searched for the most in 12 countries. The AKC now actually ranks the Cane Corso as the 40th most popular dog breed in the United States. How did this happen? Why are so many people looking to make a Corso part of their family? There are more than a few good reasons Cane Corso puppies are so highly sought after in the modern day. The name Cane Corso loosely translates to “Guardian Dog,” and it is easy to see why that is the case. These dogs have a protective nature and intimidating stance that is impossible to overlook. With weight ranges often reaching to more than 100 pounds (45.36 kg), lean and muscular bodies, and unmatched agility, it would be difficult for an attacker to get past this dog if he was standing guard on your property. In history, Cane Corsos showed off their ability to guard by serving as loyal guardians on Italian farms where they were entrusted with livestock and children to protect. Their athletic, hearty build, quick response to threats, and powerful heads give the Cane Corso an advantage over intruders. Yet, finding an intruder willing to challenge a Cane Corso standing guard would be a challenge; they’re quite intimidating in stature. Chances are, the ferocious appearance would be enough to send someone with ill-intent in another direction long before they attempted wrongdoing. In spite of the ferocity portrayed during protective mode, Cane Corsos are gentle, loving, and highly affectionate dogs to their owners. A properly trained Corso can easily get along well with small children and other pets. For centuries, these dogs have been trusted guardians in family households. This is the gentle giant you can leave snuggled with your infant without concern, knowing full well it will protect that child from anything that would do them harm. The AKC gives the Cane Corso a good ranking in agreeability and overall temperament. These dogs are far more outgoing and eager to please than some dogs that are designated as guardians. While Cane Corso puppy training is important, you should see your new pup respond really well to positive reinforcement because these dogs are hugely affectionate and loyal. Corsos are no ordinary mastiff; they have a big heart, which means your love and attention will only foster their desire to do whatever it takes to make you happy. One thing new Corso puppy owners notice rather quickly is just how alert their new family member is to the surrounding environment. These dogs have this regally serious outlook and a highly watchful temperament. The careful observation early on is exactly how the breed learns to sense impending threats, understand their owner’s emotions and apprehension, and become an excellent guardian who is oftentimes on alert before the owner realizes there is a threat. Unlike some large dog breeds, the Cane Corso is a relatively healthy breed with the proper breeding and care. The best breeders screen Cane Corso puppies for common problems like hip dysplasia, elbow issues, and abnormalities of the eyelids. The primary health concern with these dogs is bloat, which is fairly common in dogs that have a deeper chest cavity. This active breed does need plenty of exercise and proper nutrition to maintain their sleek muscular build, but most owners find this easy enough to achieve with such an active canine. Daily walks, plenty of toys and interaction, and a good nutrition plan will help support a longer life for a Cane Corso. From meager beginnings to star mastiff, Cane Corsos are bound to keep a stable footing in the world of popular dog breeds for the years to come. This canine breed has so much to offer owners, whether they want a playful housemate with a laughable goofy side or an intimidating guardian to protect their property. Strong, agile, intelligent, and adorably affectionate—there’s so much to love about these mastiffs.